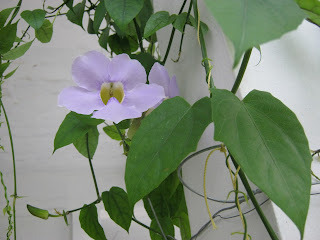 Agnes' Diary & More...: Is this a Morning Glory flower?? 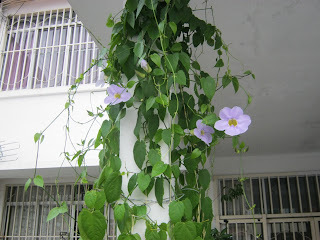 Clet put this creeping plant around the pillar at the front car porch few weeks ago. It has started flowering 2 weeks ago, it has 1 flower at first and followed by another and getting more, we are happy to see some flowers blooming, the house look more alive with flowers around especially with this purple flowers creeping high near to the ceiling. We do not know what's the name of this flower, anyone have any idea? It looks like Morning Glory to me but I am not sure. I noticed that this flower does not last long. 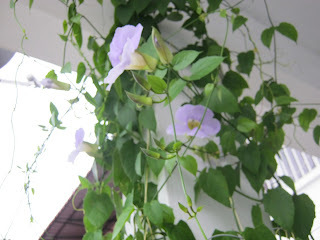 It has a full bloom in the morning and starts to wrinkle in the afternoon, some fell off on the ground at sunset. The good thing is there are new fresh flowers coming out each morning.